You are currently browsing articles tagged decorating on a budget. 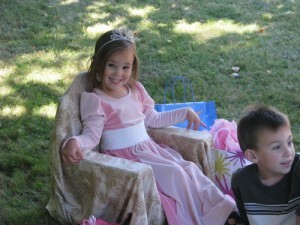 I haven’t posted anything to the blog in quite a while. I’m not sure how that happened. School started. And September birthdays and Halloween and November birthdays and Christmas holidays and somehow it’s February. I have been making things and doing things and even taking some pictures. At first I wanted to go back and post things in chronological order, then I thought maybe I should just do a summary with a bunch of pictures. But I guess it really doesn’t matter. 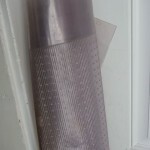 So here is the decorative shower curtain that I started about two years ago. Seems like an appropriate project to break my break. I have a bad habit of getting stuck on a project and putting it into time-out for a while. I work on other things, hope that a solution will come to me and eventually it will come back around. I’m trying to get myself out of that cycle and just make myself work through whatever difficulties arise instead of waiting months or years in between. When we moved into this house, the little bathroom was bright, shiny and completely white. I wanted to do something fun and seized on this cute fish fabric as my inspiration. The feature fabric is Mendocino Swim Class in the Pacific colorway by Heather Ross. I loved this fabric so much I used it previously as an accent in a dress for the girl along with the seahorse fabric from the same line. This time I paired it with a solid Kona cotton coordinated to the tiniest fish and a little bit of navy blue piping left over from this project. I started this so long ago I don’t remember why I had to try the curved piecing. I see that it’s not obvious in the photo but the line between the two fabrics is gently curving. I lined the shower curtain with extra wide white muslin and that is where the trouble began. For some reason I had a horrible time getting everything square and lined up nicely. You can probably still see crease marks in the fabric from where I wadded it up and threw it in the corner. My other difficulty was that I had my heart set on orange grommets. Dritz does make some colored plastic grommets but they were a tad expensive for my taste. And large. Don’t get me wrong, I like orange. It is probably my favorite color now. (Yes this is strange because I spent the first half of my life hating orange.) But a little orange goes a long way. So I bought the plain little silver colored grommets and dipped them in orange tinted Plasti-Dip. Easy-peasy. I have all kinds of other ideas for this weird but cool hardware store crafting find. I’m not sure when I started making ice lanterns. I don’t remember doing this as a child, but I don’t think I waited until we moved to Maine either, and I’m sure I couldn’t have accomplished this in Oklahoma. In any case, it’s fun and easy if you live somewhere cold enough that the temperatures stay around or below freezing for days at a time so you can admire your handiwork. These are fun to make for lighting your walk or deck for winter parties as well. 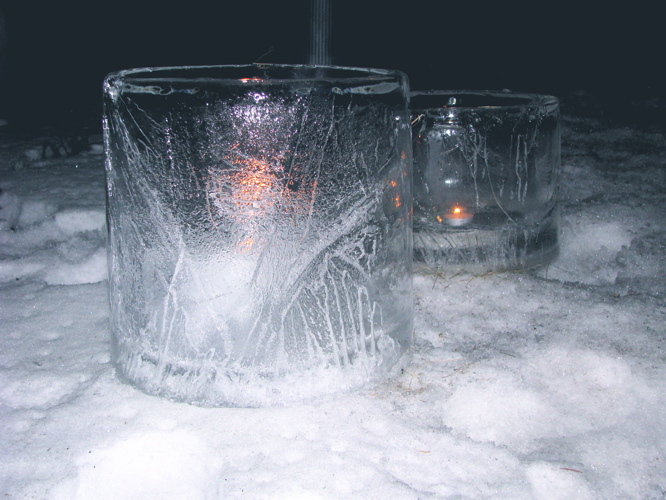 Anyway, I happened to have some smaller ice lanterns in the freezer waiting for the outside temperatures to cooperate at the time. These round ones were made outside in a 5 gallon bucket. Ice will form first on the surface of the water and the sides of the bucket. Once these edges get thick enough you will be able to carefully turn the bucket over, let the ice slide out and the unfrozen inside can simply be poured out. The top will be the thickest part and becomes the base of the lantern. I’m not a good scientist so I can’t give you any data on times or temperatures, etc. The temperature of the water to begin with, the size of the vessel and the temperature outside or in your freezer will all contribute to how clear or not clear the ice is. I don’t think it matters. One of these froze enough overnight I think, the other one was out all day and night. The smaller milk carton size will freeze in several hours. In fact, I have an unfortunate habit of forgetting to check on them and ending up with a solid block of ice instead. You can use those as candle bases in the bigger lanterns. 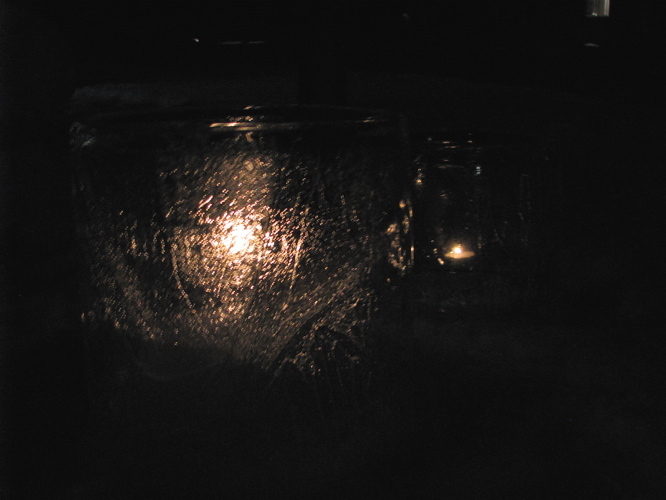 A tea light will burn for several hours protected from the wind. The ice magnifies and fractures the tiny light in an earnestly wistful way. A nice warmth to come home to when the dark descends so quickly on winter days. Too bad these are now buried under in a foot of new snow! I wonder if I should dig them out or just make new ones? drapes: finally had some uninterrupted daytime hours to do the math for the living room pinch pleat drapes. (Thank you God for MIL.) Even started cutting and seaming panels. It’s going to be tight but it will work. 21 yards of fabric. This is definitely my biggest project ever. Deadline approaching—delivery of new couch—March 15ish. socks for me: off to a great start with a hand-dyed handspun that I really like and stalled big time on the heel. I’ve turned a short row heel several times now without incident. In fact I think I have turned this same heel as many times as I’ve made socks total. Not good. I really don’t know what the problem is. I’m about ready to give up and find a toe-up heel flap even though I don’t care for the look. Dissappointing because this is my Ravelympics project and otherwise I am confident I would have been done by now with both socks. three days left, I don’t think I’m going to make it. mailing: I know this is ridiculous but I have three things here that need to be mailed, two of which have been sitting for more than a month. I just need to seal, label and get to the post office. We have a very nice post office here. I don’t know what my problem is. Same as Annie’s. cleaning/organizing: yeah, lots of that. at times it seems hopeless but I think things are getting better. I’m still seriously considering borrowing a pick-up and just hauling everything to the dump. Okay, not really seriously. I can’t stand to waste anything someone could use. So I pick through at a turtle’s pace, giving away, freecycling, etc. This could be so much easier if I didn’t care! I think that’s all I’m actively working on. There is a rather long list jumping around on the back burner of my brain as usual. It will all have to wait. I’m going to SPA Knit and Spin this Saturday and I intend to enjoy myself, meet up with some new friends and learn some new tricks. This picture is intended both to motivate me and to show off this cool vintage lamp I found. I now have all the materials and instructions necessary (I hope) to sew pinch pleat drapes for my living room. The fabric is Del Hi by Valori Wells. When I saw this fabric I knew right away this is what I wanted for my living room drapes. Warm grey and dark brown graphic flowers, avocado trailing vines and a sleek brown fleur-de-lis silhouette of a stripe against a khaki ground—a bold pattern in a neutral colorway. 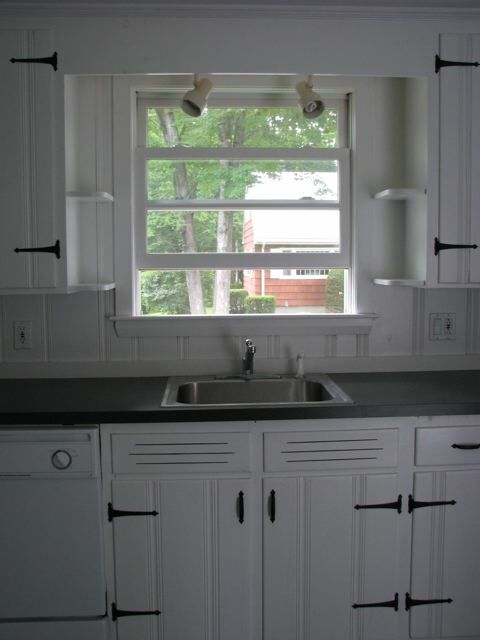 And despite my previous aversion, after reading the highly informative and funnyRetroRenovation blog and studying pictures of other houses similar in style to ours, I finally decided that nothing else would complement our ’50s ranch interior as well as pinch pleat draperies. And I love the fact that they can be opened and closed so easily and still look good. There’s really no other style like that. But back to the picture. Here you see just the unsewn fabric hanging over the current poor excuse for a curtain rod. Because I haven’t gotten up the courage to start working on these drapes. 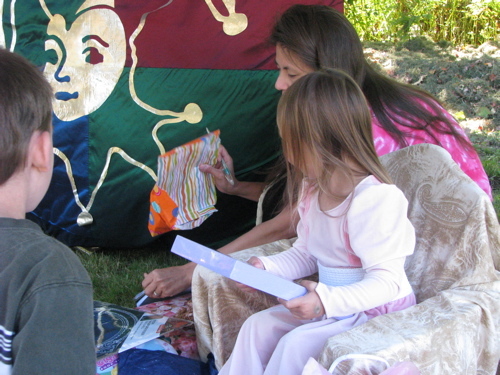 Humongous pieces of fabric and a fair amount of math will be involved. Not that I have an aversion to math, I used to be quite good at math. I just don’t usually care to involve math in creative matters. I am not one to buy antiques but I fell in love with this vintage floor lamp at our friend Rick’s barn, a.k.a. the Potato House, in Houlton, ME just off Route 95 before you get to the Canadian border. Usually open on weekends. If you like old stuff, you can spend hours going through old books and records, decades of furniture, knick knacks and doodads of every sort. 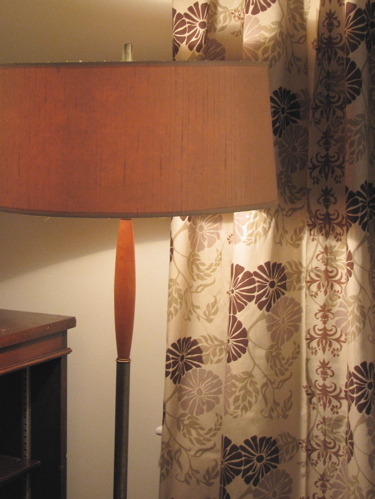 The lamp bears no indication of when it was made or who the maker might have been. It does appear to have been rewired at some point. The metal parts need cleaning but the wood is beautiful and the drum shade is in great condition. It works well as a reading light and also casts a warm glow over the rest of the room. Rich is “trusting” me on this one, the drapes I mean (oh, maybe the lamp too?). And I know it’s off my usual quiet track but I like where it’s headed. It’s going to be a comfortable, good looking room . . . little by little. and everything in its place. I don’t know who originally said that but I am certainly finding wisdom in it. I’ve been working here and there on organizing parts of the house and trying to find a home for everything, whether that is in our house or in someone else’s. I’m hoping that we can keep what is really needful and dear to us and let go of everything else. So far this is working best in the kids’ room. 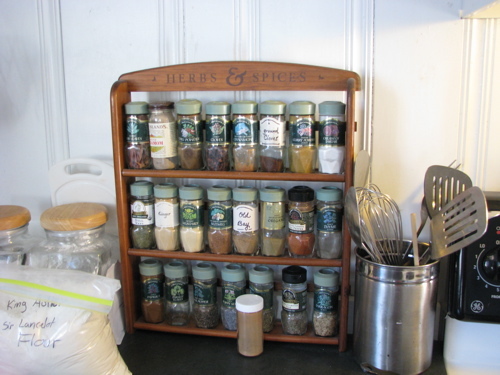 But I did make a little addition to the kitchen today. 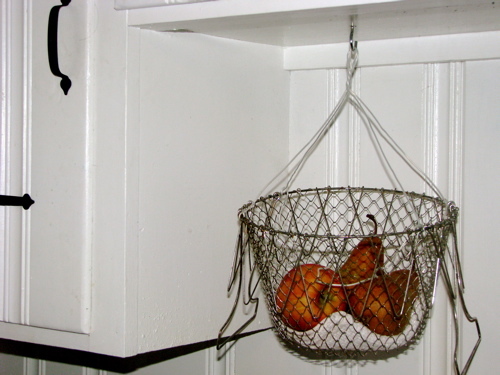 There is often a piece of fruit or two out on the counter in the way and I decided that this odd corner under an upper cabinet was a good place to hang this wire basket. It’s collapsible and has two handles on it that when held together cause the top of the basket to close almost completely around the contents. I’m sure it has some distinct purpose but I can’t even remember where I got it or why. The girl and I strung some wire through the rim, screwed a hook into the underside of the cabinet and hung our new fruit basket. It looks quite at home already. Earlier in the week or was it last week? I did some serious work with the miter saw. 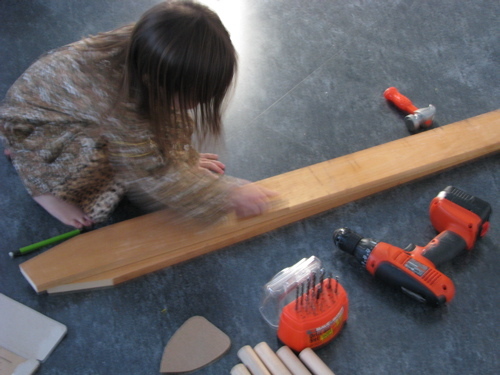 The girl donned a favorite outfit to help me with the sanding and assembly of a ladder for the bunkbeds. See her hammer there? 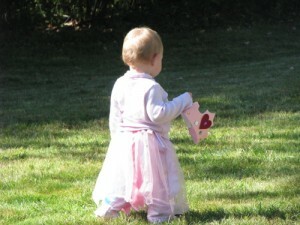 I just have to include this picture of her outfit, don’t you love her style? 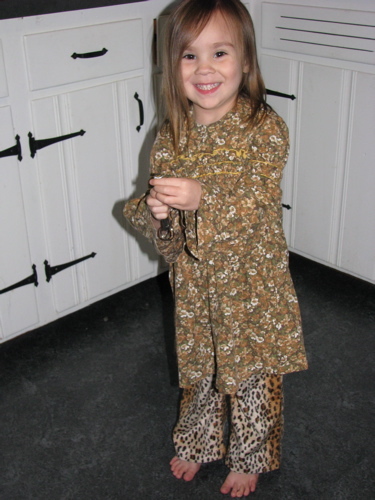 Vintage ’70s brown floral (originally made by my mother for me) with the leopard pants from her Halloween costume. She makes me smile. I would never have worn anything half so fun. I recently found out that this is actually the third generation to sleep in these bunkbeds. 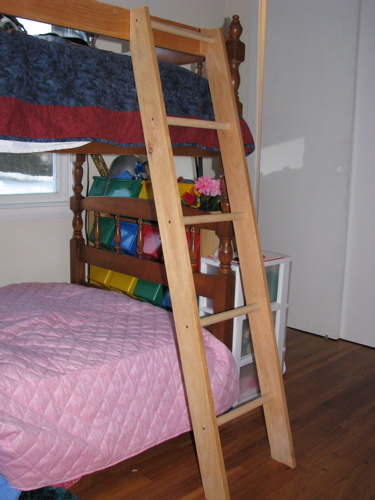 Everyone else has done just fine without a ladder but this allows me to use the space at the foot of the bed for the organizer that holds all the dress-up accessories. It’s not pretty but it’s functional and the kids like it. Maybe it will get painted as well if we get around to painting the walls. Yes, I just put that photo in at the largest size because I am that excited about this. I haven’t been sewing but I have been cutting! With the power miter saw. Okay, no angles but still. I’ve been planning this organizer for a while. I wanted something functional but reasonably nice to look at as well. 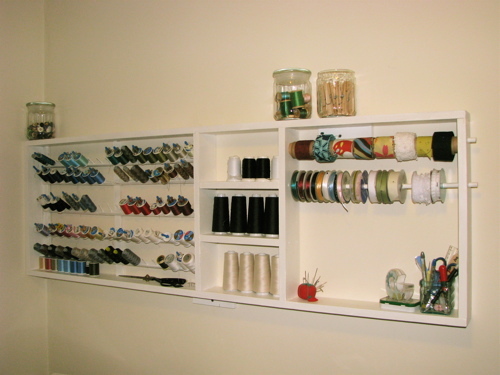 I finally made this custom fit thread and ribbon organizer to the same length as my sewing table (5 feet long). By myself! Of course the kids insisted on helping me paint it. That was fun, no really, they are starting to be truly helpful. My dad helped me hang it on the wall. Plaster walls confuse those stud finding gadgets. Almost all of the wood came from leftovers in the basement, all I bought was some screws, a skinny dowel and a piece of quarter round trim. Building the main parts of the shelf went really fast. The thread rack part did not, mostly because I was trying to recycle pieces of a store bought wooden thread rack that was too small and not made all that well. Sometimes it does not pay to recycle. I now have twice as many pegs for thread, a space for my serger thread spools and dowels for my handmade bias trim and assorted ribbons. I can easily add some more dowels for ribbons and such later. 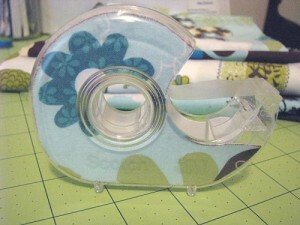 The serger spools can also be stacked two deep so there is plenty of room. 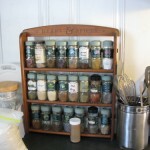 In the glass jars above are buttons, vintage wooden thread spools and clothespins. I’ll probably add some more jars as needed. Of course there is a reason you can’t see anything else in the picture. Everything below four feet is a mess. 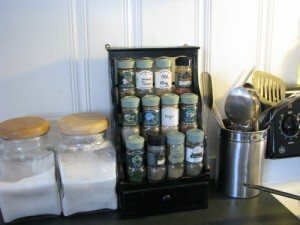 But here is one other bit of organizing that I did quite a while ago actually but it has been working out very well. 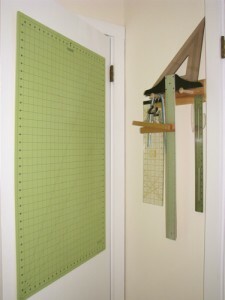 Behind the door I put up a shortened length of coat rack with a few extra nails to hold my various rulers, triangles, T-squares, etc. And the cutting mat hangs on a nail on the back of the door. PS. I have been doing some knitting but it may be difficult to get a picture of the latest finished project. I’ll try. As I alluded to in the previous post, this past week has been rather a haze. And unfortunately not all of us completely well yet. But it would seem that if I don’t share these now, they’ll lose their newsworthiness. 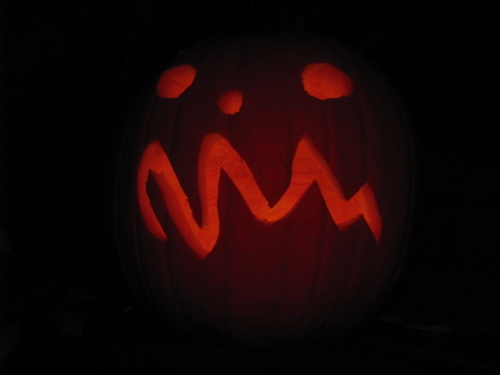 I love to carve pumpkins with out of the ordinary designs. Over the years we’ve done the Bat signal (Batman), maybe more than once, spiders and Jiji the cat from Kiki’s Delivery Service. 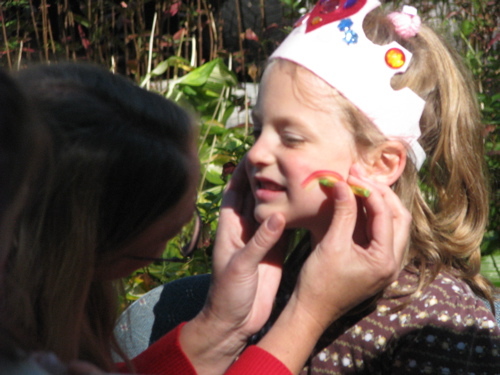 This was the first year the kids were really into actually helping with the design. 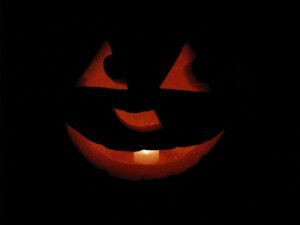 The girl was quite particular about her pumpkin having a “bumpy” smile. So we split up into teams and this is what we came up with. The carving on the girl’s pumpkin is a combination of me following what she actually drew on the pumpkin and copying from her earlier drawing on paper. The boys were much more scientific and drew their pattern on the computer first. 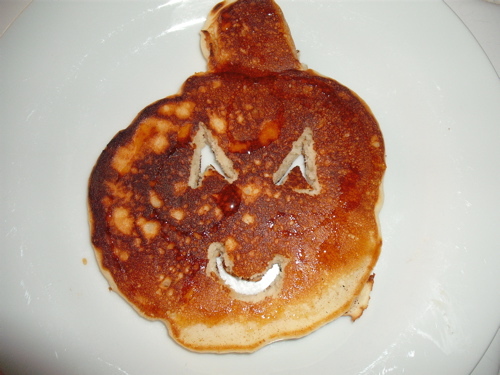 One day this week I managed to make pancakes with a seasonal twist. I used tiny alphabet cookie cutters given to me by my friend Jan to quickly shape the eyes and mouth. Homemade apple syrup from Grandmom drizzled on top for a yummy treat. 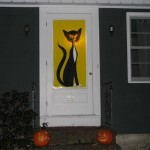 I didn’t realize this until we moved up here but New Englanders really get into Halloween in a big way. Maybe that’s because it actually feels and looks like Halloween in the movies or maybe because it’s a lot easier to decorate your house for a holiday that isn’t covered in snow and ice! In any case, people go all out and we thought we’d join in to this neighborly occasion with some sort of big decoration. 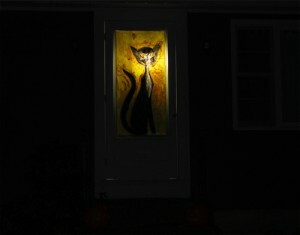 We tossed around a few things and I came up with this idea of painting a big cat to fit the opening in the screen door. I looked online for tall silhouettes of black cats and chose one as reference. I unrolled paper and cut it to size and then sketched the cat on the paper. The kids did a lot of the painting. 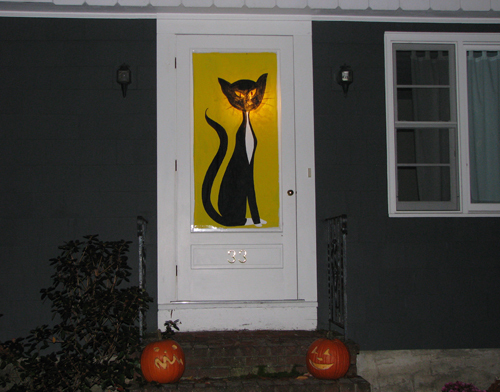 I had intended to do an all black cat but they wanted it to look like Lila, our tuxedo cat so I modified to accomodate. Not quite as scaring but still mysterious. 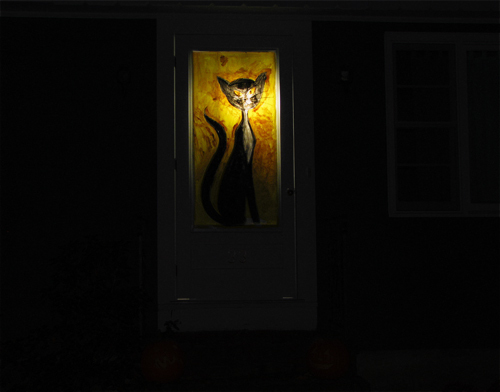 On Halloween night we turned out all the interior house lights and strung a bulb up behind the cat’s face which illuminated the whole painting well. The large brushstrokes reminded Rich of Van Gogh’s style. An unexpected benefit. The kids were awed by their creation and I really enjoyed working together with them. It was difficult to photograph so here is my attempt at a Photoshop combination that simulates what it looks like in real life. And I did finish sewing those costumes despite my foggy head. 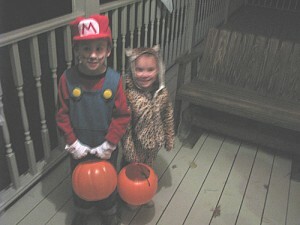 But because the camera batteries were dying I only have this one photo of Mr. Mario and the leopard. We took a quick trip around the neighborhood and were rewarded with treats from the neighbors and a surprise scare from Mr. R. across the street sporting a scary ghost mask that made the girl cry. Mr. R’s wife scolded him and he couldn’t take that mask off fast enough! 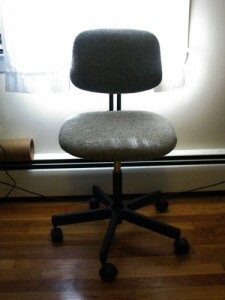 Due to the popularity of this project I have uploaded pictures of how I recovered my chair (with hopefully helpful notes) to Flickr here. 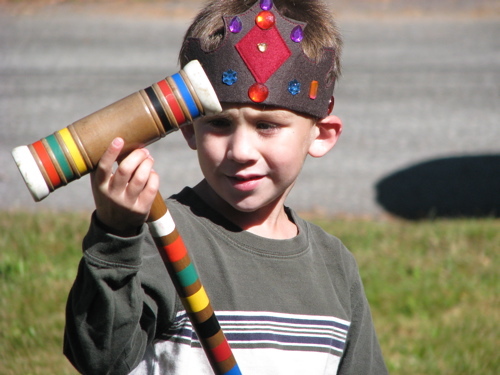 There is also a link to a group where you can upload pictures of your own finished project! 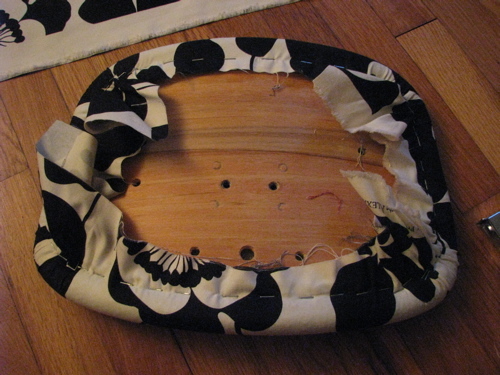 This was really not hard, I used less than a yard of home dec fabric and it didn’t take very long either. Instant gratification, I hope you’ll try it too. I am really enjoying this personal touch to my sewing space! We’ve had this plain gray office chair for a while and I decided I wanted to dress it up a bit. 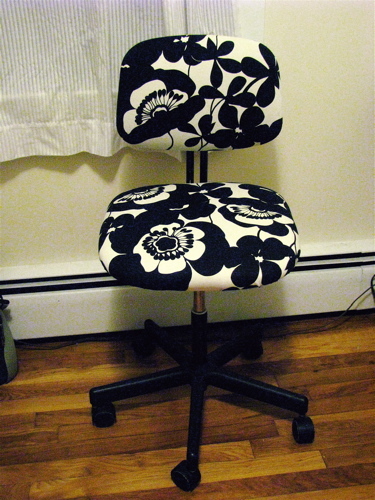 I had bought a yard of this Alexander Henry floral called Sofia a few months ago, I didn’t know what I was going to use it for and suddenly it clicked—the chair! I haven’t done this before but it was surprisingly easy. Taking the chair apart and putting it back together was the only hard part because it required figuring out how to use the socket wrench. I’m pretty pleased with the results. New lighting in the dining area finally! We had some damage to the ceiling in the dining area due to an ice dam this winter. The old light fixture had to come out anyway and I decided there was no way I was putting it back up after the ceiling was fixed. It was an old two socket track light much like the one over the kitchen sink, very strange. I hunted around for the perfect pendant light to hang here as we spend a lot of time at the table, eating and crafting. 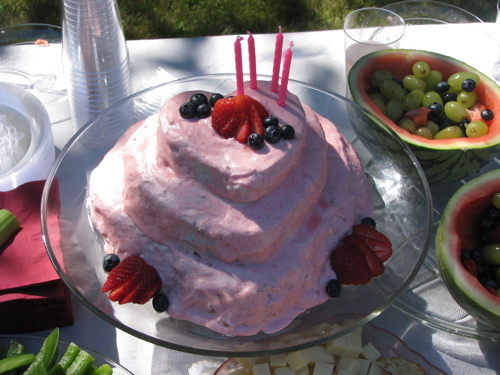 I think it was also the first major design decision we were making so that weighed on me as well. 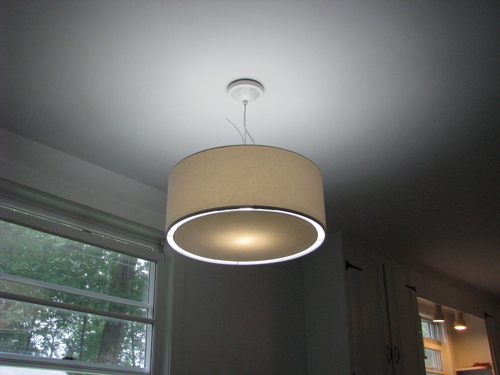 I decided I wanted to counter all the hard rectangles of the kitchen with a round light. In my research about 1950s decorating I discovered that it was very common to mix colonial cabinetry in one area with space-age modern in another! So I decided to go for it and get a crisply modern looking drum pendant from CB2. At 20″ around it seemed huge in the box but it’s a big room so I was pretty confident it was going to look just fine. I bought the lamp for an incredible price knowing that it was fitted with a plug so I would have to do a little work to hardwire it. What I didn’t realize was that there was a very important little piece of metal missing from the ceiling box. So after the lamp arrived, I spent about a month hunting around for that piece of metal, not wanting to buy and install a whole new ceiling box in the plaster ceiling. Finally, I had a conversation with my dad who said (of course), “Oh, I’m sure I have one of those.” Thankfully my dad keeps all those sorts of spare hardware pieces that you never know if you’ll ever need again. Two days later I was standing on a chair with my hands in the electrical box when my loving spouse says, “I hope you know what you’re doing.” Thanks for the vote of confidence dear. 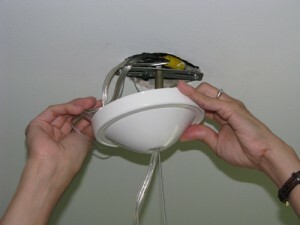 Actually, he was quite helpful, and we were able to get it installed without too much trouble. I’m quite pleased with the results. Now we’ll just have to get a new table and chairs to go with our pretty lamp! I’m gearing up to decorate my “studio” and I’ve chosen a palette of colors. The walls are a very pale butter yellow which I will keep. 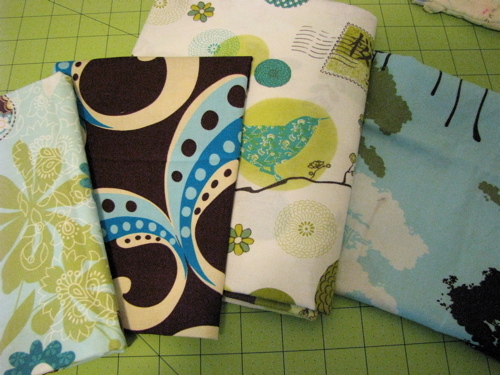 I think I’ll be using these fabrics as accents. They have similar avocado-y green tones, light blues with a hint of aqua and dark browns. I have some dark brown and blue canvas as solids and a great deal of the trees on blue print. That one may get used for curtains. 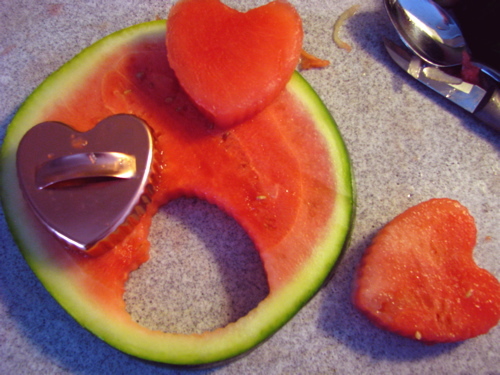 Anyway, spur of the moment I decided to use a bit of one of those remnants to make something pretty. 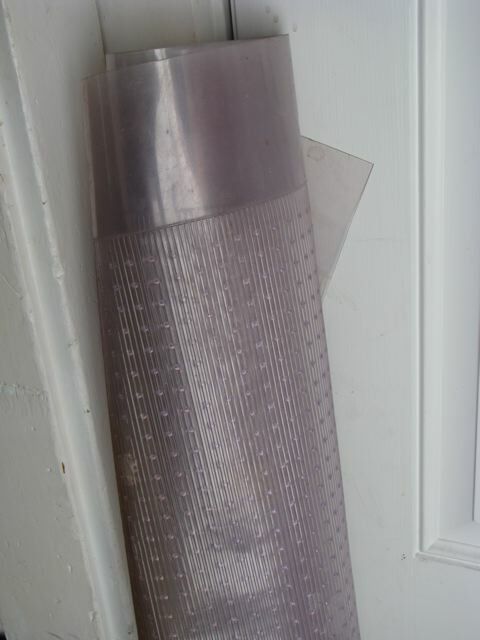 I have a roll of heavy duty vinyl carpet protector runner. It has nubbies on one side and ridges on the other. Anyway, we don’t have any carpet in this house so I don’t need it but I haven’t been able to give it away. With mud season upon us here in New England you would think somebody would love to have this to protect a carpeted entryway! I wasn’t particularly looking to repurpose it but I was looking for something with ridges to help with wet felting and I cut off a piece of the runner to try out the ridges. Since I was in the bathroom working on the felting, it was only a short leap to realize that nubby side up it made a great soap holder! 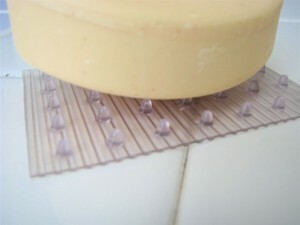 Since you buy it by the running foot at the hardware store a small square for a soap holder costs just pennies. Looks pretty cool doesn’t it?